I found the utterly charming Edgewater Hotel in Winter Garden, Florida by mistake when I thought my high school friend used to live in Winter Garden. Wrong town. He used to live in Winter Park. No matter, Winter Garden was such a treat, and the Edgewater Hotel a most perfect stay. 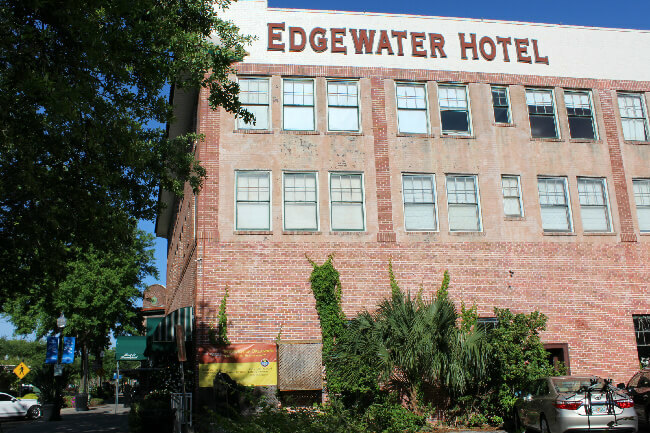 I discovered the Edgewater when I searched for “historic hotels near Orlando” with the idea of finding somewhere unique. I found it. First opened in 1927, the restored Edgewater Hotel, is a mix between an inn and a bed and breakfast with a history that includes being a high class getaway for businessmen and celebrities in the 1920s–Clarke Gable stayed here, to housing soldiers waiting to go overseas during WWII, and later serving as a home-away-from-home for some of the construction crews building Walt Disney World. 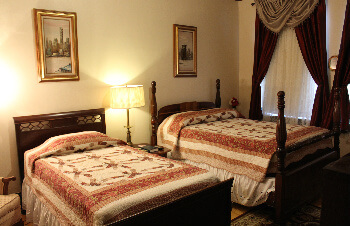 My one night stay began after a 30-minute easy drive from the Orlando International airport to downtown Winter Garden. The Edgewater is right in the middle of town where boutique type stores and eateries from Thai food to pizza to ice-cream abound. Because there wasn’t room in the hotel parking lot next to the building due to the businesses that share the space, I parked on a side street just a block from the hotel’s front door. Unfortunately, I forgot to re-read the directions I was emailed on what to do before arrival. Call to give a heads up you’re almost there. Because the hotel is actually on the 2nd floor, the first floor check-in counter is not a 24/7 with a person on hand to greet you when you walk in. I made the mistake of calling the number listed on phone at the check-in counter. All that did was make the phone ring. After three attempts, I looked on the hotel brochure in a rack on the counter for another number. Bingo. Within a few minutes, I was checked in by a smiling employee who came from upstairs to give me a parking pass for the dashboard of my car, my door key (which also works the main door to the hotel) and a time slot for my made-to-order breakfast. The best part about check-in was the ride in the elevator to the 2nd floor. 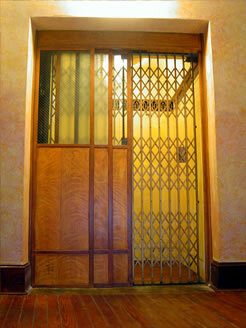 The elevator–an Otis, is the oldest operating elevator in Florida. This is the type of elevator where the gate has to be manually closed and the operator has to hand-crank the mechanism to get the elevator to go up. There is a company that services the elevator so no worries. The original Otis elevator is just the first part of the Edgewater’s unique charm. 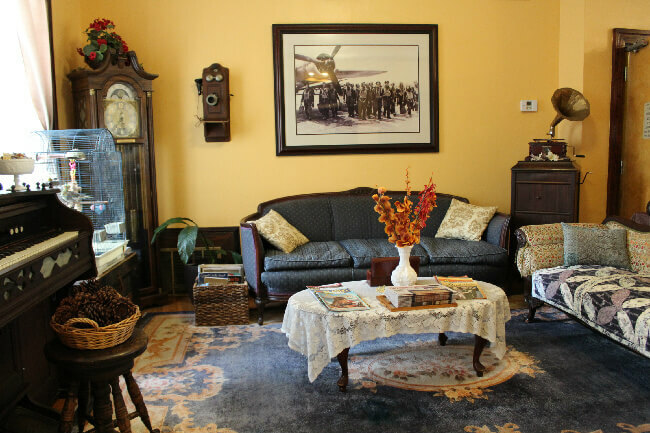 First, the main area of the hotel is a parlor, dining room combo with antique furniture and knickknacks similar to a great aunt’s house. There are two bird cages with singing birds and a piano with a candy dish filled to the brim. 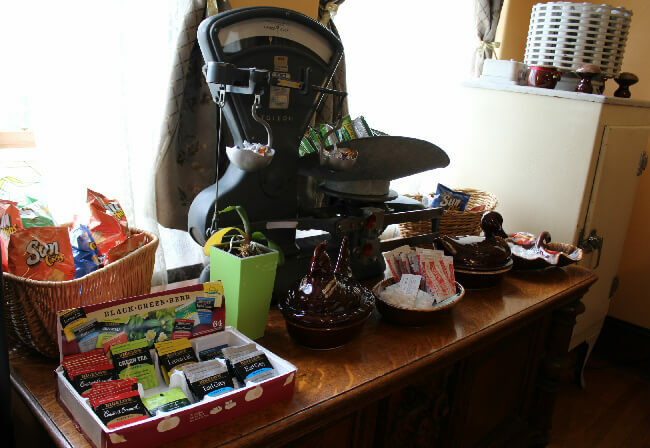 The dining area includes a sink, two refrigerators for guest use–bottled water and Half and Half is in one of them, and plenty of mugs for serve yourself tea, hot chocolate and coffee. There are small bags of chips and granola bars to enjoy for no extra cost. As I browsed the decor, I enjoyed seeing certain items re-purposed. For example, an antique scale serves as the granola bar bowl on one side and a candy dish on the other. My room, with a double and a single bed, had plenty of homey touches like an armchair with a reading lamp, a dresser, quilt bedspreads and antique hangers in the wardrobe. Bathroom fixtures are also antiques but work like brand new. In a nod to modern day amenities, rooms have flat screen TVs. 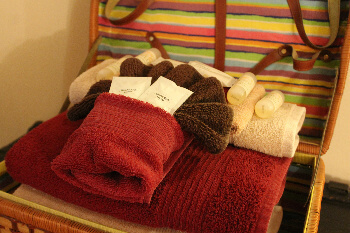 The wicker basket with folded towels and artfully arranged bottles of shampoo was a lovely, clever touch. Also, the gel foam mattress topper made for some mighty comfortable slumber. 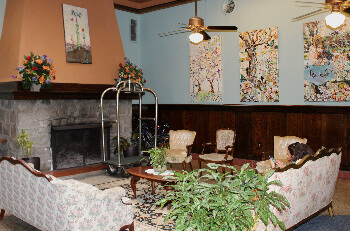 Each hallway has antique furniture and artwork completing the feel that this could be a person’s estate and you’ve come to visit. Although I spent most of my time on my own, I did talk with a few guests. One couple lived just a few minutes away but decided to treat themselves with a stay cation that included taking in the West Orange Bike trail for which Winter Garden is known. Another couple who I talked with at breakfast was from Spain and had come for a wedding. Breakfast is served in shifts in order to accommodate the guests who can order off a fairly extensive menu. I had scrambled eggs, three strips of crisp bacon and french toast dusted with powdered sugar as well as orange juice. I could have had more. The real maple syrup was another terrific touch. Of the 15 different guest room configurations, some of them are two bedroom suites and some have just one bed. My room, including breakfast, was $112. This included tax and is for two people. The most expensive suite is $146. As an alternative to the buzz of activities around Universal Studios and Walt Disney World, I’d consider staying at the Edgewater Hotel. It really was a most marvelous stay. I did go visit my friend after check-in. When I came back there was plenty of space to park in the parking lot where I left my car while I explored Winter Garden. This is a you can walk almost anywhere town. You can book directly at the Edgewater Hotel website or check out Priceline to see if the price is lower.